Brookfield Zoo said it has “taken prompt action” after allegations that a zoo employee posted a racist comment about serving “rude a– white people” to social media while working at the facility. “Yesterday, we became aware of the actions of a single employee which we agree are unacceptable,” the Chicago Zoological Society said in a statement. “This employee’s statements in social media are in violation of our policies and do not reflect our institution’s values. 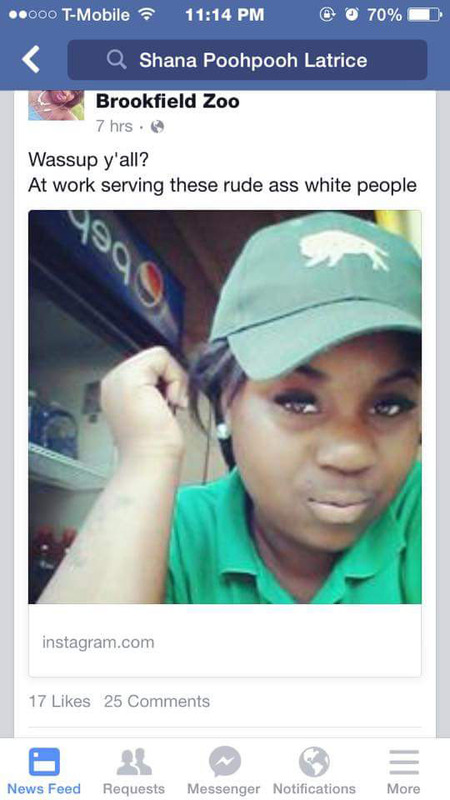 A photo posted Monday shows an employee wearing a Brookfield Zoo uniform with a caption reading “at work serving these rude a– white people.” The photo tagged Brookfield Zoo and almost immediately sparked outrage from some customers. One customer posted the woman’s photo to the zoo’s Facebook page and wrote that she felt the post was “extremely racist” and the employee “crossed the line.” Her post was shared more than 6,000 times and had more than 7,300 likes by Tuesday morning. Since the initial post, hundreds of customers have written on the zoo’s Facebook page, calling for the employee’s removal. Some, however, have said the employee shouldn’t lose her job over the post.